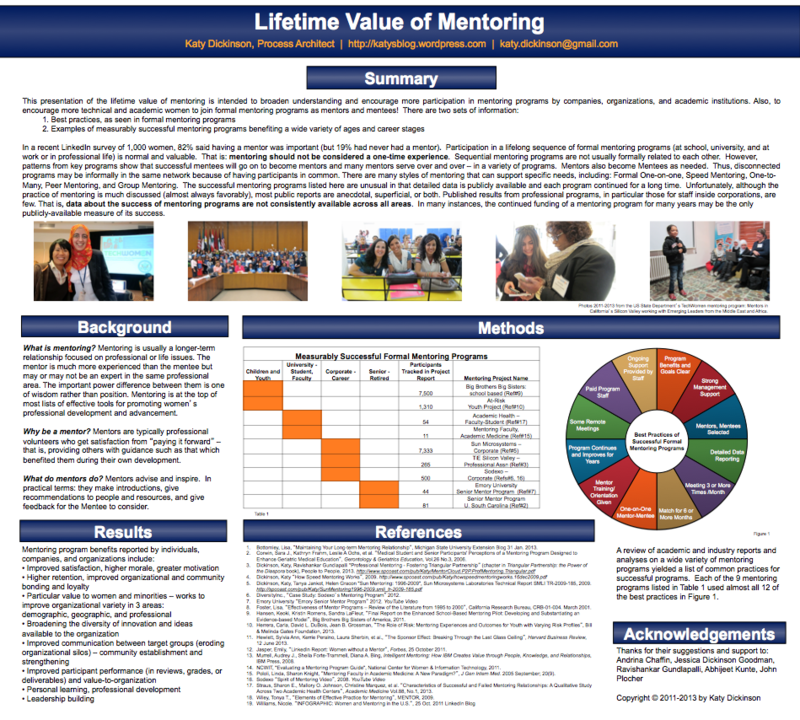 I am almost done with my Grace Hopper Celebration of Women in Computing poster on “Lifetime Value of Mentoring“, to be presented next week. GHC13 is sold out again – as it has been every year since at least 2009! I am very much looking forward to attending next week. My daughter Jessica Dickinson Goodman will be presenting her own GHC13 poster. In addition to the poster, Trish Tierney (Executive Director of the Institute of International Education in San Francisco) and I are presenting a SOL (Student Opportunity Lab) on “Empowering Technical Women Through Global Mentoring”. The material of this GHC13 SOL was developed in collaboration with four TechWomen co-presenters from the Middle East who regretfully are unable to attend this SOL in person. Thanks to Sukaina Al-Nasrawi of Lebanon and Maysoun Ibrahim of Palestine (TechWomen Inaugural Class 2011), Adla Chatila of Lebanon and Heba Hosny of Egypt (TechWomen Class 2012) for their welcome support and valuable advice. In a recent LinkedIn survey of 1,000 women, 82% said having a mentor was important (but 19% had never had a mentor). Participation in a lifelong sequence of formal mentoring programs (at school, university, and at work or in professional life) is normal and valuable. That is: mentoring should not be considered a one-time experience. Sequential mentoring programs are not usually formally related to each other. However, patterns from key programs show that successful mentees will go on to become mentors and many mentors serve over and over – in a variety of programs. Mentors also become Mentees as needed. Thus, disconnected programs may be informally in the same network because of having participants in common. There are many styles of mentoring that can support specific needs, including: Formal One-on-one, Speed Mentoring, One-to-Many, Peer Mentoring, and Group Mentoring. The successful mentoring programs listed here are unusual in that detailed data is publicly available and each program continued for a long time. Unfortunately, although the practice of mentoring is much discussed (almost always favorably), most public reports are anecdotal, superficial, or both. Published results from professional programs, in particular those for staff inside corporations, are few. That is, data about the success of mentoring programs are not consistently available across all areas. In many instances, the continued funding of a mentoring program for many years may be the only publicly-available measure of its success. Mentoring is usually a longer-term relationship focused on professional or life issues. The mentor is much more experienced than the mentee but may or may not be an expert in the same professional area. The important power difference between them is one of wisdom rather than position. Mentoring is at the top of most lists of effective tools for promoting women’s professional development and advancement. Mentors are typically professional volunteers who get satisfaction from “paying it forward” – that is, providing others with guidance such as that which benefited them during their own development. Mentors advise and inspire. In practical terms, Mentors make introductions, give recommendations to people and resources, and give feedback for the Mentee to consider. Bottomley, Lisa, “Maintaining Your Long-term Mentoring Relationship”, Michigan State University Extension Blog 31 Jan. 2013. Corwin, Sara J., Kathryn Frahm, Leslie A Ochs, et al. “Medical Student and Senior Participants’ Perceptions of a Mentoring Program Designed to Enhance Geriatric Medical Education”, Gerontology & Geriatrics Education, Vol.26 No.3, 2006. DiversityInc., “Case Study: Sodexo’s Mentoring Program” 2012. Foster, Lisa, “Effectiveness of Mentor Programs – Review of the Literature from 1995 to 2000”, California Research Bureau, CRB-01-004. March 2001. Hansen, Keoki, Kristin Romens, Sandra LaFleur, “Final Report on the Enhanced School-Based Mentoring Pilot: Developing and Substantiating an Evidence-based Model”, Big Brothers Big Sisters of America, 2011. Herrera, Carla, David L. DuBois, Jean B. Grossman, “The Role of Risk: Mentoring Experiences and Outcomes for Youth with Varying Risk Profiles”, Bill & Melinda Gates Foundation, 2013. Hewlett, Sylvia Ann, Kerrie Peraino, Laura Sherbin, et al., “The Sponsor Effect: Breaking Through the Last Glass Ceiling”, Harvard Business Review, 12 June 2013. Jasper, Emily, “LinkedIn Report: Women without a Mentor”, Forbes, 25 October 2011. Murrell, Audrey J., Sheila Forte-Trammell, Diana A. Bing, Intelligent Mentoring: How IBM Creates Value through People, Knowledge, and Relationships, IBM Press, 2008. NCWIT, “Evaluating a Mentoring Program Guide”, National Center for Women & Information Technology, 2011. Pololi, Linda, Sharon Knight, “Mentoring Faculty in Academic Medicine: A New Paradigm?”, J Gen Intern Med. 2005 September; 20(9). Straus, Sharon E., Mallory O. Johnson, Christine Marquez, et al. “Characteristics of Successful and Failed Mentoring Relationships: A Qualitative Study Across Two Academic Health Centers”, Academic Medicine Vol.88, No.1, 2013. Wiley, Tonya T., “Elements of Effective Practice for Mentoring”, MENTOR, 2009.